"The presence of people today on the streets all over Islamic Iran... means that the enemy will never reach its evil objectives," a defiant President Hassan Rouhani told those thronging Tehran's Azadi (Freedom) Square, decrying a "conspiracy" involving Washington. 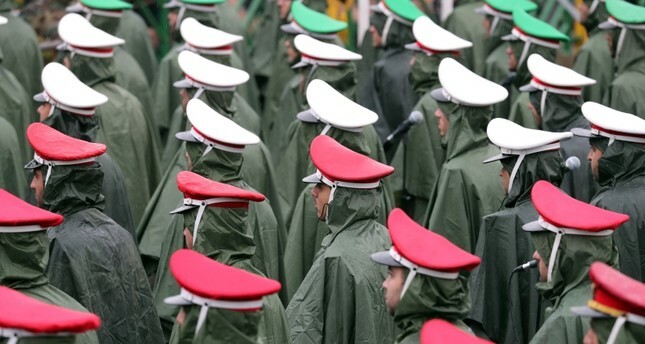 Chador-clad women, militia members in camouflage fatigues and ordinary citizens marched through the capital in freezing rain to commemorate the day in February 1979 that Ayatollah Ruhollah Khomeini ended millennia of royal rule. Life-size replicas of Iranian-made cruise and ballistic missiles stood in a statement of defiance after the U.S. last year reimposed sanctions following its withdrawal from a deal on Tehran's nuclear programme. "We have not, and will not, request permission from anyone for increasing our defensive power and for building all kinds of... missiles," he told the crowd. Speaking from a flower-festooned stage overlooking the square, the president warned that Iran was now far stronger than when it faced off against Saddam Hussein's Iraq in a devastating 1980-1988 war. "Today the whole world should know that the Islamic Republic of Iran is considerably more powerful than the days of the war," Rouhani said. Seemingly reaching out to his political critics within the country, the president added: "The more we allow different ideas, beliefs and (political) factions the stronger our system will be." A pre-prepared resolution was read out ahead of his speech that proclaimed "unquestioning obedience to the supreme leader Ayatollah Ali Khamenei" and called U.S. President Donald Trump an "idiot." In a tweet written on the anniversary that he also sent out in Farsi, Trump said the revolution had been a complete failure. "40 years of corruption. 40 years of repression. 40 years of terror. The regime in Iran has produced only #40YearsofFailure," he wrote. "The long-suffering Iranian people deserve a much brighter future," the American president added. "If this regime makes the awful mistake of trying to destroy Tel Aviv and Haifa, it will not succeed," he said. "However, this would be the last anniversary of the revolution that they celebrate." The events Monday were the culmination of official celebrations called the "10 Day Dawn" that marks the period between Feb. 1, 1979, and Feb. 11 when Shiite cleric Khomeini returned from exile and ousted the shah's last government. But despite the official festivities, today's Islamic republic faces acute economic challenges as it struggles with a mix of domestic hardships and U.S. sanctions. Banners held by marchers or hung along the streets bore slogans including "Death to America," "Death to Israel," "we will trample on America," "40 years of challenge, 40 years of U.S. defeats." A number of Israeli and American flags were set on fire by the crowds. An anchor on state television warned of hostile foreign media trying to downsize the participation of Iranians in the march but expressed confidence that "they would be confounded by the unprecedented level of attendance." He compared the U.S. sanctions and economic hardships to "riding a bicycle when someone puts a stick in the wheels" but pointed to advances in other fields as more than making up for them. "On the revolution's 40th anniversary we are at the top for scientific achievements like nanotechnology or accurate missiles," he said. Cleric Hossein Firouzi told AFP Iran's revolution had achieved everything it set out to in terms of military power, political identity and scientific achievements. "Iran has changed from a backward nation to a world power," said the 50-year-old.